While there is no cure for malignant mesothelioma, there are treatment options that can help patients improve their prognosis and reduce symptoms. Surgery, chemotherapy and radiation are standard treatments for malignant mesothelioma. Multimodal therapy is often the option physicians recommend for treating mesothelioma. If viable, emerging treatments may be a better option for patients. Palliative treatments help reduce symptoms of mesothelioma. Thousands of people are diagnosed with mesothelioma each year, leading many patients and families down a difficult path of determining a treatment plan. With a very poor prognosis, the life expectancy for malignant mesothelioma patients can range from as little as a few months to around a year, challenging treatment options. However, with continued research and advances in cancer studies, there is hope for boosting the efficacy of treatments and finding new methods that may one day lead to a cure. After diagnosis and initial testing, mesothelioma patients will need to develop a treatment plan. A treatment plan can offer cancer patients and their families peace of mind, outlining viable treatment options, a general timeline of treatment frequencies and establishing a medical care team. Together, members of the healthcare team will make informed decisions regarding what’s best for the patient’s mental, physical and emotional health and well-being. Mesothelioma is a very rare type of cancer, and not all physicians are well-versed in the disease and its treatment options. For many patients, the best option for their healthcare is to travel to a cancer institute where they can seek professional and experienced care from a mesothelioma specialist. When researching renowned clinics and doctors, patients may find physicians that specialize specifically in malignant pleural mesothelioma, peritoneal mesothelioma or pericardial mesothelioma. 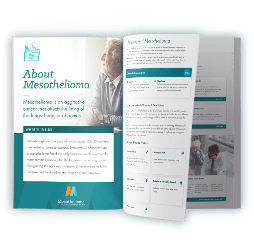 Mesothelioma specialists lead or participate in the latest research regarding the cancer, equipping them with knowledge of effective emerging treatments and new clinical trials. Often locations for new clinical trials and hopeful emerging treatments, these cancer clinics offer innovative care and an array of treatment programs specifically for those diagnosed with mesothelioma cancer. There is no cure for mesothelioma, and with a relatively low life expectancy, standard cancer treatments may not be viable for these patients. When looking at the standard of care for mesothelioma patients, treatments include surgery, chemotherapy and radiation. Aims to remove as much of the cancer as possible when diagnosed at an early stage, or offers palliative care for later diagnoses, often targeting fluid buildup in the pleural space, abdominal cavity or chest cavity. Can be used neoadjuvantly or adjuvantly to shrink mesothelioma tumors or kill cancer cells remaining. Chemotherapy drugs can be used on their own, in multimodal treatment, or palliatively. Targets and destroys cancerous mesothelioma cells, preventing them from reproducing. Radiation therapy is often recommended for those in poor health due to fewer side effects. Multimodal treatment, or a combination of several standard treatment options together or paired with emerging treatments, are commonly recommended for any type of mesothelioma. One of the most successful multimodal approaches is surgery with HIPEC, a form of intraoperative chemotherapy, used in treating peritoneal mesothelioma. Emerging treatments and clinical trials offer much promise, with new options like immunotherapy showing success in treating malignant mesothelioma. Clinical trials allow physicians to test the efficacy of new treatment options, while patients are able to try something new if their cancer is unresponsive to traditional treatments. Mesothelioma treatment is not straight-forward and could be limited depending on overall patient health, staging, cell type and the type of mesothelioma. Curative treatment options may not be viable for patients, limiting them to palliative care. Poor overall health: Patients with poor health will have a weakened immune system, unable to withstand the side effects of aggressive treatments like chemotherapy, which can damage both cancerous and healthy cells. Late stage diagnoses: Patients diagnosed early on have more options for treatment, whereas those diagnosed at stage 3 or stage 4 are often limited to palliative care as the cancer has metastasized to the lymph nodes and distant organs. Aggressive cell type or cancer type: Sarcomatoid mesothelioma is often more aggressive and difficult to treat than epithelioid, similar to some rare cell types with poor prognosis. Palliative care options focus on limiting or eliminating symptoms, instead of targeting the cancer itself. This could be as simple as occupational therapy or as complex as a surgical procedure. Insurance plans will often cover some medical costs of cancer treatment. However, insurance limitations, loss of income from being out of work, a need for home care assistance and other fees can lead to a growing financial burden. Patients and their families should establish a financial plan to better understand all costs associated with mesothelioma treatment. Mesothelioma victims or their loved ones may also be eligible for compensation to help pay for treatment. Options may be veterans’ benefits, compensation through a mesothelioma and asbestos lawsuit or workers’ compensation. Ideally, patients will be able to determine a financial plan to accommodate all costs associated with getting the best treatment and care possible. 1 American Cancer Society. Chemotherapy for Malignant Mesothelioma. Updated February 17, 2016. 2 American Cancer Society. Radiation Therapy for Malignant Mesothelioma. Updated February 17, 2016. 3 American Cancer Society. Surgery for Malignant Mesothelioma. Updated February 17, 2016. 4 Berghmans T, Paesmans M, Lalami Y, et al. Activity of chemotherapy and immunotherapy on malignant mesothelioma: a systematic review of the literature with meta-analysis. November 2002;38(2):111-121. doi:10.1016/S0169-5002(02)00180-0. Tonya Nelson is an experienced writer and editor, who has published on a wide variety of topics, particularly in the health field. Her bachelor’s degree in magazine journalism from the S.I. Newhouse School of Public Communications at Syracuse University sparked her curiosity for writing stories about environmental and medical issues. As the Managing Editor, Tonya oversees the content development process, ensuring every article and informational page published adheres to MAA Center’s editorial guidelines. Page last modified on August 30, 2018.